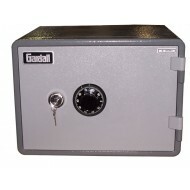 This one hour Gardall fire safe comes with a durable powder coat paint in gray and dark gray. "Microwave" simply refers to the appearance of the safe. 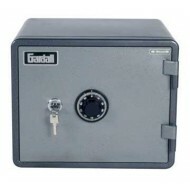 This security safe comes with a pull out shelf. 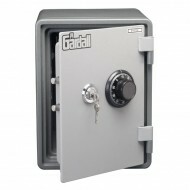 When you are selecting the safe that is right for you be sure to add 1 1/2" to the outside depth for the handle. 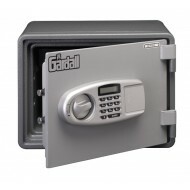 Comes with dual combination and key lock..
Gardall MS119 1 Hour Microwave Fire Safe is a part of a line of Gardall safes that were named "microwave" because their appearance resembles a microwave oven. This safe has a KIS one hour fire rating. 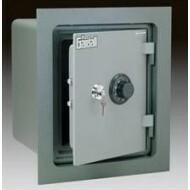 This is a heavy duty safe built with steel and offers protection from burgalry as well as fire protection. 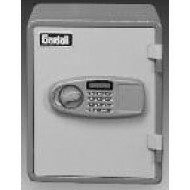 Features of the safe include heavy duty hinges with plated interlocking bolts to deter door removal, center bolt to fasten safe down securely, laser cut door for a precise fit and a strong steel body providing extra strength. 1 hour fire protection rating from U.L. 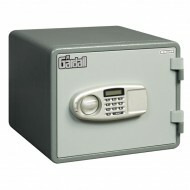 assures you that your contents will be secure in the event of a devastating fire. 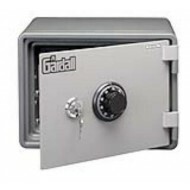 The MS129 is the larger of the two vertical microwave size fire safes from Gardall. 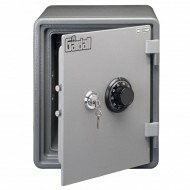 This unit comes with an anchor hole and bolt down hardware included so you can secure your safe's location. 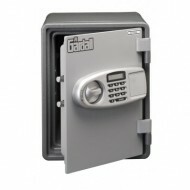 The dual lock requires you to turn the key first and then dial your combination. A removable shelf improves your storage options.